Each year many sellers think to themselves “Should I list now or wait until the spring market?” and each year that can be a difficult question to answer. This blog is not here to encourage you one way or the other. It’s purpose is to show you some real data, to provide you with information and possibly bring up more factors to consider when making your decision. The simple and short answer is “List when you’re ready”. However, if you’re like me and interested in looking at it from a strategical point of view, feel free to continue reading. I have comprised sales data from the previous 5 years below. In Clarington, apart from 2018, every year has experienced an increase from January to May. With that being said, there is truly no real trend. There is no consistent best month or worst month. Based on these results I would say February-April has been the most successful months over the past 5 years. Oshawa has experienced lower prices in May than in January 2 out of 5 years. In 2015 and 2016 there were large gains made from winter to spring. Again, there is no obvious best month but there is something to be said about February to April as possibly your best odds over the past 5 years. 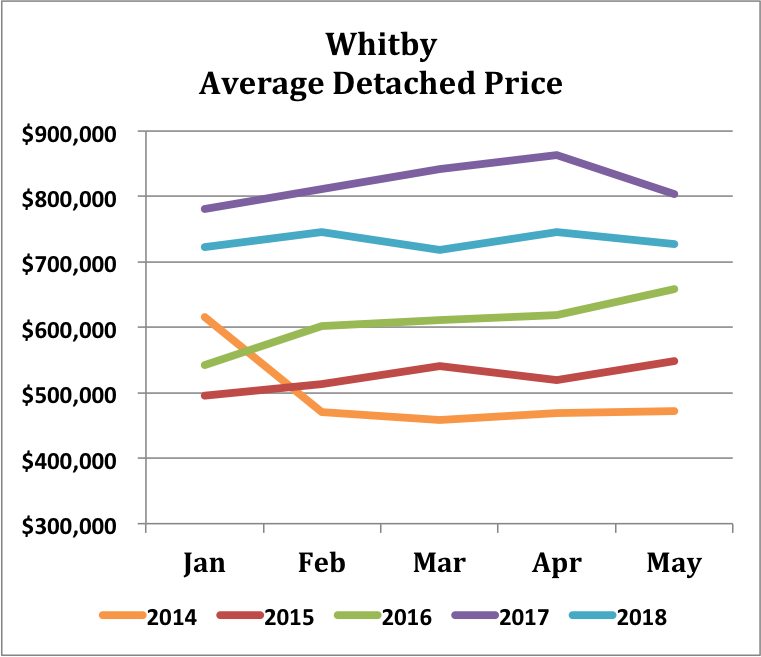 Each of the past 5 years, Whitby has ended May with higher average prices than in January except for an outlier month in January 2014. In the past two years April has been the best time to sell. In 2015 and 2016 The best month was May. After looking through some of Durham Regions larger markets it is apparent that there is no guaranteed “best time to sell”. When collectively looking at each month in each market it is safe to say that April has on average performed the best and January performed the worst. Keep in mind that the peak of the 2017 market which proved to be unsustainable at that time was in April. That peak certainly contributed to April’s overall performance over the past 5 years. First, it is important to note that anything below 3 Months Of Inventory (M.O.I) is widely considered a Sellers Market. In Clarington March and April have had some of the lowest M.O.I.. The past 2 years M.O.I has spiked in May. 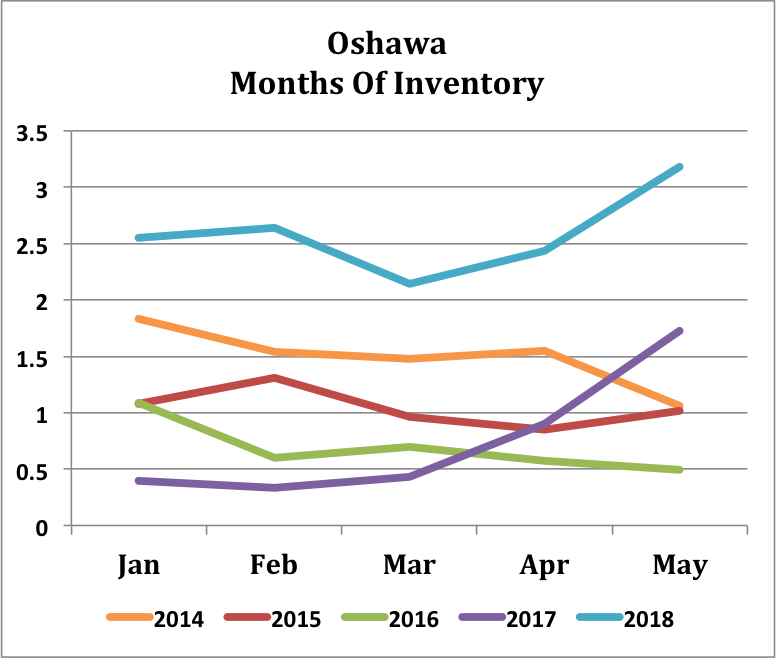 In Oshawa, last May was the first time we reached a Balanced Market over the past 5 years. We saw similar spikes in May over the past 2 years but also similar results as Clarington in 2014 and 2016 where May saw the lowest M.O.I.. February to April appears to again be the sweet spot over the past 5 years. Whitby shows similar results to Clarington and Oshawa. Again, March and April have the lowest average M.O.I.. Again, we saw spikes in May 2017 and May 2018. We also saw the same results in May 2014 and 2016. The question of inventory is simple. There is more inventory in the spring than in the winter. However, it is more beneficial to consider the increase in demand during the spring months too. To do this we look at the Months Of Inventory (M.O.I). It looks as though in each of these markets we see some very similar results. April appears to have the lowest average M.O.I when looking at all of these markets collectively. This is thanks to an increase in the number of buyers during this month. Once May hits the M.O.I begins to increase again because many buyers have purchased over the past few months. It was surprising to see January have the highest M.O.I on average. This is likely due to left over inventory from December’s slower market and lack of ready buyers at that time of year. When deciding to list your home there are many factors to consider. When you are looking at timing it out perfectly there are even more considerations to make. 1. Are you also planning to buy? Same Area? If prices increase from January to May and you will be looking to purchase your next home, you must keep in mind that the higher prices will impact you both when you buy and when you sell. Same thing applies if prices were decreasing during that time. 2. Are You Ready For A “Beauty Contest”? Typically as the weather gets warmer more and more houses will hit the market, thus giving buyers more choices. Although it is always important for your house to show well, it is all the more important that your house is ready to compete in a “Beauty Contest” with the other homes. 3. Landscaping & Outdoor Features? All data has been acquired from the Toronto Real Estate Board’s MLS monthly statistics.